Within a matter of days after the press release for a newly published Nature paperspewed the usual it’s-worse-than-we-thought headlines throughout the alarmosphere (Washington Post, BBC, New York Times), the paper’s results were assessed to have “major problems” by an author of multiple CO2 climate sensitivity papers (Lewis and Curry, 2015, 2018). A glaring miscalculation was quickly spotted that changed not only the results, but consequently undermined the conclusion that estimates of climate sensitivity to doubled CO2 may be too low. And yet the paper was able to pass through peer review anyway. A few years ago Dr. Michael Mann was the lead author of an embarrassingly non-scientific paper fraught with glaring methodological and statistical errors. Despite the glaring errors, the paper made it through peer-review and was published in Nature‘s Scientific Reports journal anyway. 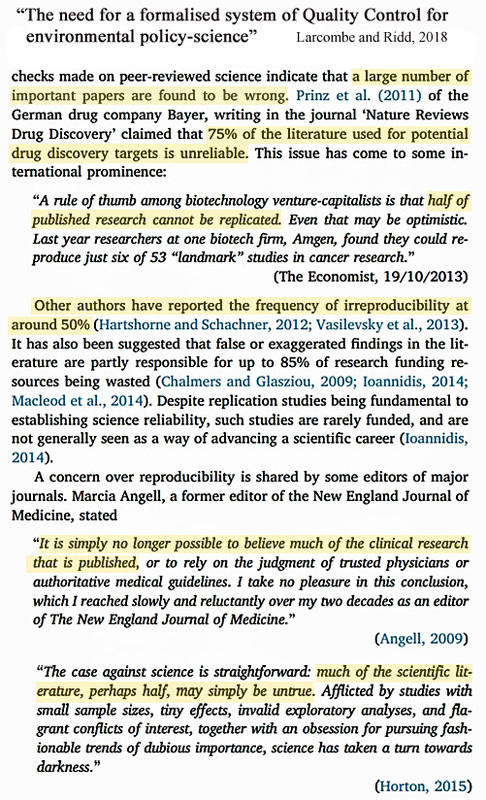 Analyses indicate that experiments have been conducted that show “fake peer review” often goes undetected, and that 70% of deliberately-written “hoax” papers with ridiculous and meaningless results can get published in peer-reviewed scientific journals. 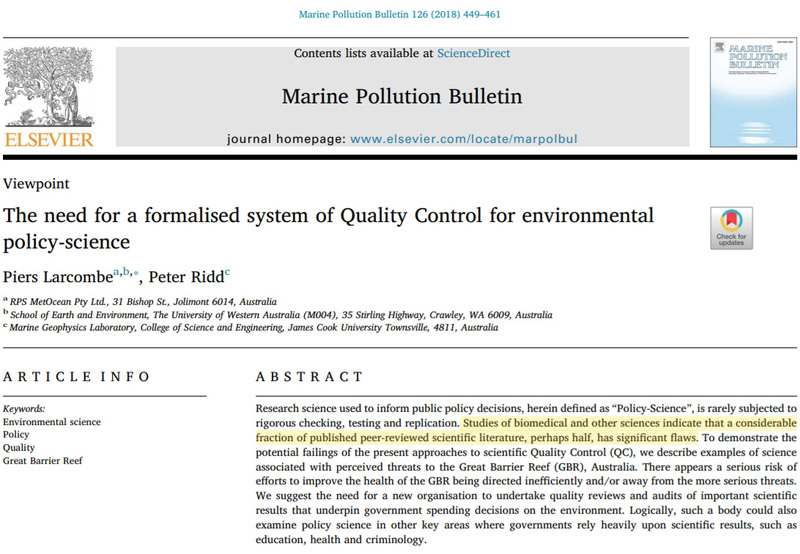 Earlier this year, a review paper (Larcombe and Ridd, 2018) published in the journal Marine Pollution Bulletin delivered a stinging rebuke to the modern version of science’s disturbing lack of replicability and verifiability. The authors go on to detail a large volume of examples when peer-review failed to detect errors in Great Barrier Reef (GBR) coral research. Confirmation bias appears to permeate the peer-reviewed literature, slanted in the direction of finding evidence for catastrophic decline in coral health. This isn’t the first time that marine research has been called out for overselling calamity (see Cressey, 2015, “Ocean ‘calamities’ oversold, say researchers – Team calls for more scepticism in marine research.”) and falling “into a mode of groupthink that can damage the credibility of the ocean sciences”. As just a single example among the many provided, Larcombe and Ridd reviewed the De’ath et al. (2009) study in which an “unprecedented” decline in GBR corals was alleged to have occurred between 1990-2005. After a reanalysis of the measurements and methods used, Larcombe and Ridd determined that the corrected data show there has actually been “a small increase in the growth rate” of corals since the early 1900s (as shown in the below image) instead of the dramatic decline after the 1990s documented in the peer-reviewed paper. These errors slipped past the reviewers’ notice too. The publication of flawed results has seemingly become so common that it’s no longer even surprising.